Five days ago, there was a surge of joy in Romania after the website EurActive reported that the European Union was going to pass legislation requiring the United States, Australia and Canada to provide uniform treatment for citizens of all EU states on the subject of visas. Since those three countries (USA, Canada and Australia) all have the right to visa-free travel in the European Union, the EU was going to demand reciprocity, meaning that all citizens of EU countries could equally travel visa-free to those three countries. If the three countries failed to do so, the EU was then going to require their diplomats to go through the rigamarole of obtaining a visa to travel here. Currently, the citizens of five EU countries, Romania, Poland, Bulgaria, Cyprus and (newest member) Croatia are still required to go to the American embassy in their country, pay an exorbitant fee (currently $160) and then be interrogated by perverts who publicly boast about masturbating to your Facebook photos if they want to travel to the United States. The proposed EU changes would’ve rectified all that, making it possible for the first time for Romanians to be treated as equals in America. Sadly, just 24 hours later, the EU clarified its position and stated that there was no plan to demand visa reciprocity so it looks nothing will change in the near future. Fool me once, shame on you. Fool me 5,942 times, shame on me. Failure to obtain a visa waiver for travel to the United States has been a big issue here in Romania (and Poland) for a long time. Victor Ponta was in Washington in October 2013 and pressed the American government to grant Romanians the visa waiver. Mircea Geoana, who seemingly is always in Washington, has repeatedly done the same. The Americans have responded each and every time by laughing and telling Romanian officials that they’ve “made a good case” for the visa waiver and yet nothing has changed. Before the EU clarified its position, Geoana got another 15 seconds of fame in the Romania media as he was invited onto all of the news channels to talk about the happy news. I know that Geoana would sure like to be the one to broker this because he’s under the illusion that one day he’ll be the Secretary General of NATO, and that Romania’s good friend Victoria Nuland has more or less promised her support to him in getting the position. I’m also quite sure that Geoana, after years of being a reliable embassy snitch, truly believes that he will be rewarded by his masters for his unstinting loyalty. Unfortunately, that’s not how the American government does business. There’s a very good reason why the United States has refused to grant visa waivers to Romania and Poland and it has nothing to do with security or risk assessment or immigration requirements or anything sensible like that. The real answer is strategic. Romania and Poland are so afraid and hateful of Russia that they’ll do literally anything that the American government asks of them and so there’s no strategic motive to give them anything. If your stupid dog will do a trick without getting a reward, why bother it giving one? A few weeks ago the Washington Post reported that the American government paid Poland 15 million dollars so it could use an old Polish army base to torture people. We know that the CIA used a Romanian government building in Bucharest to torture people. Did Romania get paid as well? So far there’s not a single report of such a payment, which means that it looks like the American government fucked over Romania for free. When (then) American Secretary of State Hillary Clinton signed an agreement in 2011 with the Romanian government to build a completely useless missile base in Deveselu, a deliberate provocation to Russia, do you know what that document actually said? I do. You can read it here for yourself (PDF). It says that the Deveselu missile is part of Romania’s commitment to be a useful NATO ally, a decision that’s already cost the completely broke (and heavily indebted) Romanian government millions of dollars in buying equipment it doesn’t need. But we know that both President Basescu and Mircea Geoana have been promising the American embassy for years (since at least 2007!) that Romania will buy all its expensive military equipment from the United States. 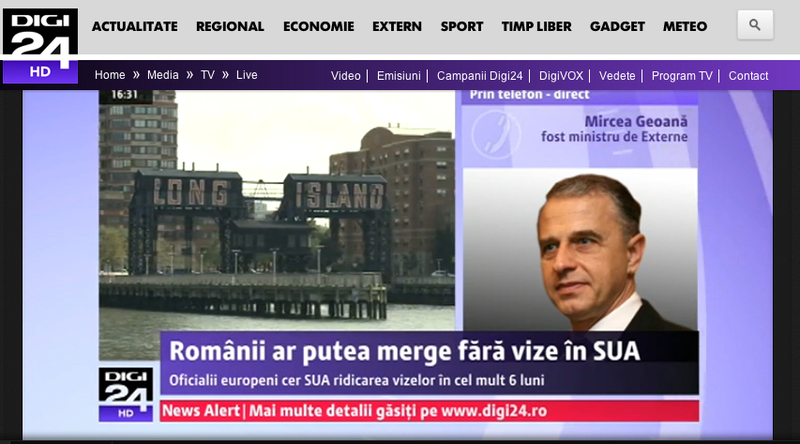 In case your Romanian is rusty, it says that the Deveselu missile base will increase Romania’s security and thusly will have the indirect effect of stimulating American and foreign investment in Romania. I think we all know that isn’t going to happen any time soon. But even though Romanians have no free access to travel to the United States, you’ll be happy to know that this weekend the Army Times reported that American troops are now going to be transporting their soldiers and equipment to kill innocent people in Afghanistan via the airbase at Mihail Kogalniceanu just outside of Constanta. You might remember from my article Mircea Geoana for President that this airbase is the only place in the entire country that I’ve ever been where it is forbidden to take photographs from a public street. Mind you, I’ve filmed inside of City Hall, in the entrance to courthouses, inside other government buildings and been yelled at and confronted numerous times by deeply suspicious employees but I’ve never once been threatened with arrest because what I was doing was completely legal. I’ve also filmed outside of several Romanian military buildings, gotten drunk on a Romanian army base and gotten hands on to closely inspect Romanian Army missile launchers. All of that was permissible but taking a photograph of a far distant airbase (at least a kilometer from the public roadway we were on) is illegal? Only because it involves the Americans, of course. Americans can prevent Romanians from taking photographs in public spaces in their own country. Americans can murder Romanians and get away with it but not the other way around. Americans can torture people in Romanian government buildings and force Romania to go into debt when the economy was doing just fine. American vulture capitalists can destroy Romanian state-owned enterprises for massive profits. The American Ambassador can humiliate his Romanian servants and then retire from his post to make big profits working for a Romanian company currently under investigation for wide-scale fraud. American pedophiles with strong connections to the embassy can freely wander around Romania and interact with children. And of course, Americans can travel to Romania visa-free while at the same time the American government is milking Romanians for $160 a pop (and if your visa application is rejected, you definitely don’t get your money back!) for the “privilege” of getting sexually molested at the airport when they finally make it to the United States. Hmm, now who’s hungry for some apple pie? Previous Post With friends like these, who needs enemies? Next Post Why is Romania so poor?